Reversal alert! I’m seeing this double top forex pattern on EUR/AUD’s 4-hour time frame and price just broke below the neckline, confirming that a downtrend might take place. As you can see from the chart below, the chart pattern is approximately 800 pips in height so the resulting selloff could last by the same amount. Fundamentals seem to suggest further declines, as the Australian Q4 2015 GDP just beat expectations with a 0.6% expansion versus the projected 0.5% uptick. Prior to this, the RBA issued a pretty confident assessment and outlook for the Australian economy, acknowledging the pickup in the non-mining sector and labor market improvements. Even though Chinese PMI readings came in below expectations, news of a reserve ratio requirement cut from the PBOC seemed enough to revive risk appetite, as investors became hopeful that monetary stimulus could boost global growth prospects. In contrast, the euro hasn’t been faring so well since euro zone inflation estimates recently fell short of consensus. The flash headline CPI showed a 0.2% decline instead of staying flat, reviving fears of deflation in the region, while the core CPI slipped from 1.0% to 0.7%. With speculations of ECB easing back on the table this month, euro bears might have enough strength to push this pair much lower. 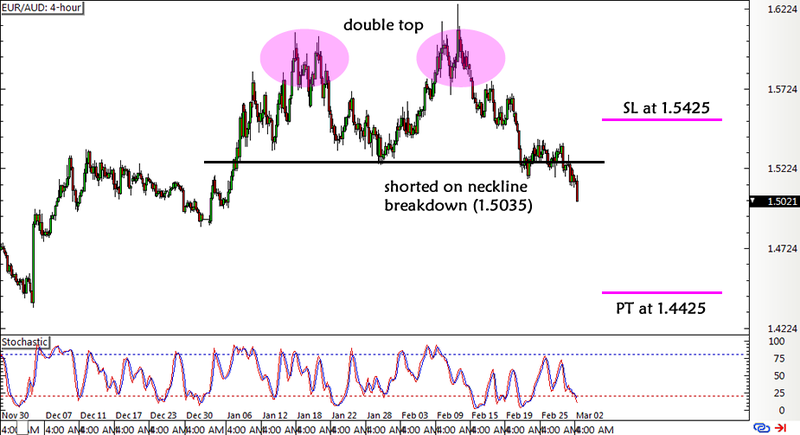 Shorted EUR/AUD at market on neckline breakdown (1.5035), stop loss at 1.5425, initial profit target at 1.4425. I’m risking 0.5% of my account on this trade and aiming for a 1.5:1 return-on-risk, but I’ll consider adding to my position or just trailing my stop if price continues to show bearish momentum. Don’t forget to check out our risk disclosure and follow me on my social media accounts for quick updates!